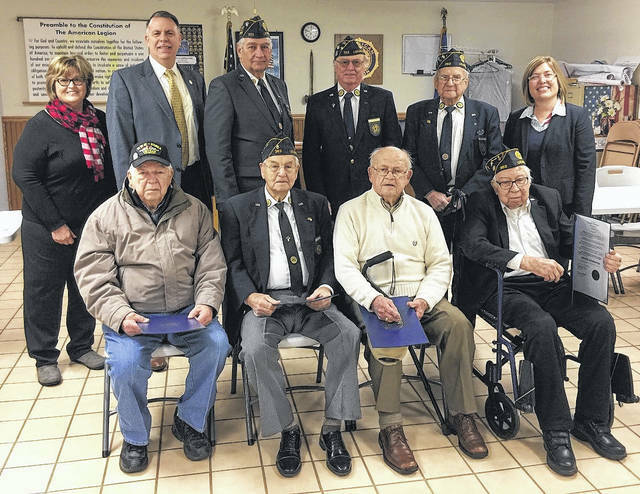 Surviving veterans of World War II were honored on Wednesday, January 17, 2018, at the William A. Baker Post 363 American Legion in Lucasville, Ohio. The post’s surviving WWII servicemen include Ora Picklesimer, Frank Andronis, Evan Elliott, Richard Gilcher, Eugene McJunkin, and Robert Smith. The morning began with a visit from retired U.S. Army Colonel and current Ohio Veterans Affairs Department Director Chip Tansill, who first visited with each veteran over coffee and donuts, sharing stories of service, and then presented each of them with a commemorative coin and a proclamation from Gov. John Kasich. The visit highlighted the service and sacrifice of the courageous men and women who served under extremely arduous conditions in a bitterly fought war, and who did all that was asked of them to fight against hatred and tyranny. Americans are free, because of the sacrifice throughout history of brave men and women like those honored at the post on this winter morning. The men, who are now in their late 80’s and 90’s, talked of their experiences, which included sinking submarines, eating tasteless meals in extremely harsh conditions, and one talked about how when he returned home from service, his mother had cut up his uniform to make pillows and other necessary household items for the family. WWII Veteran Richard Gilcher talked about how his grandson discovered his old uniform in storage, took it out, and mounted it in a memory box, so it would be preserved and take a rightful place of pride in their family home. The proclamations detailed that on September 1, 1939, at the beginning of the Second World War, the stability of our world was at great risk. So, approximately 839,000 Ohioans answered the call to serve in World War II, and of those nearly 23,000 Ohioans gave their lives in service to protect and preserve our great country. Our veterans continue to serve in so many ways. On this day, Post 363 Commander Ron Caldwell, and other members of the Post were on hand for the WWII tribute, and he talked about how the veterans of our communities are often still working to help others. The group that gathered on Wednesday morning, one of the coldest days of the year, were preparing to brave the snow and ice to serve as an honor guard at a friend and fellow soldier’s memorial service, participating in a military ceremony to honor them and comfort family members. During the recent hurricane and historic floods that devastated parts of Texas, Post 363 put a call out to the community to help, asking for donations on Facebook. The community answered that call and stepped up to donate over $20,000 in a few days. Later, when they had a box truck full of water to load and deliver to Texas, they again asked for volunteers. The next morning more than 20 men and women were there at 9 in the morning to help load the truck, and they finished the job in a little more than an hour. Another project they are actively working on is the Southern Ohio War Memorial. The Southern Ohio War Memorial Foundation is a nonprofit group of local and regional veterans who are currently fundraising to build a war memorial in southern Ohio. The site will represent all branches of the armed services, and will be established on US Route 23 North, two miles north of Lucasville. The purpose of the war memorial is to honor all fallen heroes from WWI, WWII, Korea, Vietnam, Iraq and Afghanistan, and around the world. Please consider joining this project. For more information contact co-chairman Evan E. Elliott at sowmfoundation@gmail.com and visit the project website at www.SOWMF.org to learn how you can help. In all ways, big and small, let’s remember those who serve our nation. Let’s honor our veterans, past and present, brave men and women in service to others who are always there to answer the call when their communities and neighbors need help. Libby Brisker and Gina Hall Collinsworth co-chair Operation Thank You Scioto County Veterans, a veteran’s food drive project. Operation Thank You is a community-wide initiative that has grown in scope and service over the last 4 years. The food drive kicks off on September 11th National Day of Service and continues through Veterans Day, November 11. Last year, the project delivered more than 2,000 cans of non-perishable food items to 175 local veterans. Volunteers come together to collect, sort and distribute the food door-to-door, with fresh apples, bread and cans of food, also included is a letter from the school children to our veterans thanking them for their service. These letters are often the start of a pen pal friendship that both sides cherish. Partners for the project include Portsmouth West Elementary Schools and Mrs. Jennifer Morgan’s 4th Grade Class, the VA Clinic of Scioto County staff and volunteers, Compass Community Health, The Red Cross Ohio River Valley Chapter, RSVP of Scioto County/COAD, American Legion James Dickey Post 23, United States Daughters of 1812 Scioto Valley Volunteers Chapter, Scioto County Foster Grandparents, 4-H Teen Leaders, Fuhrman’s Orchards, Scioto County Convention & Visitors Bureau and The Potter’s House Ministry. For more information, contact Libby Brisker at lbrisker@gmail.com or Gina Hall Collinsworth at ginahallcollinsworth@gmail.com.